ACCIONA's Big Smile wind project in western Oklahoma is all about supplying clean energy—but it also honors one of the company's employees, Jennifer Koop-Krass, who helped make the project happen. The alternative energy business is certainly about energy, whether it is wind, solar, biomass, or geothermal. But the business is also about people, the people who make things happen in alternative energy. Jennifer (Jen) Koop-Krass was one of those people who made things happen—big time. The former director of energy marketing at ACCIONA Energy North America, Koop-Krass was responsible for working with utilities, lining up their purchases of power from ACCIONA's wind farms in the U.S. Colleagues describe her as hard working, thoughtful, strong, confident, and kind—and possessing an ever-present very big smile. Sadly, Koop-Krass passed away after a courageous battle with ovarian cancer in 2011. Only 35 years old, she had just recently married. Though she will undoubtedly live on in the memories of her family and colleagues, Koop-Krass also lives on through one of ACCIONA's wind farms. In her honor, the company named a project in western Oklahoma, Big Smile. "Jen was a remarkable person, colleague, and friend, and her bravery had a profound effect on our company and its employees," said Dan Foley, CEO of ACCIONA Energy North America. "During her life, Jen accomplished so much personally and professionally—Big Smile Wind Farm at Dempsey Ridge in Oklahoma will serve as one example of her great contribution." Koop-Krass contributed greatly to the company's success in the U.S. and Canada as she was one of the company's earliest employees upon its entry into the North American market. "Jen was an all around great person," added Lisa Leipzig, project manager on the Big Smile wind project. "She was very thoughtful and kind—and she had this big smile that would just light up a room. "Jen was also a pioneer," she added. "She was a leader in having one of our projects, the Red Hills wind farm (also in Oklahoma) be the first in the U.S. to be validated and registered under the Voluntary Carbon Standard (VCS) and listed on APX's VCS Carbon Registry." The VCS Program provides a global standard for approval of credible voluntary offsets. ACCIONA's Red Hills Wind Farm was the first U.S. renewable energy project to be validated and registered according to the same stringent methodology that governs renewable energy projects registered under the Kyoto Protocol. Validating the Red Hills Wind Farm was a lengthy process with third party confirmation ensuring that the project met all the requirements of VCS. It was viewed as a groundbreaking accomplishment—and was led by Koop-Krass. The 132 MW Big Smile project is essentially Red Hills' sister wind farm and is located across 10,888 acres of Roger Mills and Beckham Counties in Oklahoma. The project is just 15 miles west of Red Hills, which was put into service in June 2009. Working with Mortenson Construction, ACCIONA completed the installation of Big Smile's 66 Gamesa wind turbines at the end of last year. They have been powered up and gradually connected to the grid, reaching full commercial operation in May. The Big Smile wind farm at Dempsey Ridge will create enough clean energy to power 46,000 homes in Oklahoma and surrounding states and will avoid the emission of approximately 339,000 metric tons of CO2 per year from conventional power plants. The project will generate more than $20 million in tax revenue for Roger Mills County and provide supplemental income to participating agricultural landowners through its 99 lease agreements. As with virtually all wind power projects, Leipzig noted, "it took a few years to get a shovel in the ground, but we're all very proud of the project." Oklahoma is, of course, known for being a big traditional energy provider, with large oil and gas reserves. But the state is also well recognized, and well measured, for its wind resource potential, currently ranking in the top 10 U.S. states for wind energy potential. Having developed and built the Red Hills project, ACCIONA was well aware of the wind resource in the area. Rolf Miller, ACCIONA's director of wind resources, explained that the quality of the wind resource on the site is due to a number of factors. "For starters, the topography is a gentle east-west oriented hillside with no flow obstacles, such as buildings or trees, to speak of," he said. Power from the Big Smile project goes through a 230kV line to the Sweetwater Switching Station of the Public Service Company of Oklahoma. ACCIONA has an interconnection agreement for the entire 132 MW of the wind farm. "The wind is strong, and even better, it blows relatively constantly from the south. This interplay between topography and wind in a perpendicular configuration is nearly ideal." ACCIONA also already knew the local area and the local people. "This is our second wind farm in Roger Mills Country, so we were aware of the great community base there," explained Lisa Leipzig. "The community was very supportive of wind development and welcomed ACCIONA into their local community." Wind farms are not new to this part of the state; there are a number of other wind farms in the region. The local government and the State of Oklahoma are both in the know when it comes to energy in general, due to extensive oil and gas developments and most recently, renewable energy projects. "It's always refreshing to be able to work with a county government that is educated in wind development and operating wind farms," says Leipzig. In addition to the local government, ACCIONA worked with more than 100 local landowners, signing 44 wind easement agreements and 29 transmission easements. Generally, wind developers in Oklahoma have found landowners to be knowledgeable when it comes to lease arrangements as many have already negotiated oil and gas leases on their properties. In fact, the Big Smile site has a number of active oil wells. "It was a large group of people to work with, but the landowner base was very supportive of the project," says Leipzig. "It was helpful, too, to be working with local regulators who are educated in terms of the permits and the timelines and the equipment for having a wind project in their community." The State of Oklahoma itself is supportive of alternative energy. In 2010, it established a renewable energy goal for electric utilities operating in the state. The goal calls for 15 percent of the total installed generation capacity in Oklahoma to be derived from renewable sources by 2015. The state's two largest utilities, Oklahoma Gas and Electric and Public Service Company of Oklahoma, have been adding wind power to their energy portfolios for several years. The State of Oklahoma provides a state income tax credit to producers of electric power using renewable energy resources from a zero-emission facility located in-state. The zero-emission facility must have a rated production capacity of 1 MW or greater. The credit is $0.0050/kWh for the first ten years of operation. There are also property tax exemptions for five years, with counties reimbursed by the State. During the project development phase, Leipzig explained, ACCIONA participated in an extensive county permitting and review process. The company also conducted biological assessments, bird and bat impact studies, and wetland delineation to address wildlife concerns. Public meetings allowed local communities the opportunity to review the wind farm maps and pose questions regarding the results of environmental impact studies. Following these meetings, ACCIONA secured the permits required to begin construction. "We really embrace sustainable development and social responsibility as a company," says Leipzig. "Sustainability is not a buzzword at our company—that's the way we do business. We're always careful to do environmental studies pre-construction, before we get too far into the development of a project, to make sure we don't encounter issues. With the Big Smile project, we didn't have any endangered species or threatened species." During the construction phase, they sent out regular newsletters to landowners, updating them about the project's progress. The company also had several information meetings, to notify local people about the specific construction that would be happening on the site. "During the early months of construction, we had a coffee get-together at one of the local diners, and we were there with our construction folks, just in case landowners had any specific questions." Some people came to ask questions, and reflecting that this is small town Oklahoma, some folks just dropped by to say "hi". When it came to one-on-one communication, Leipzig called individual landowners to update them on construction activities. "I suppose I'm kind of old school that way—I think they appreciated the personal touch." The roughly 11,000 acres the Big Smile project occupies is mostly agricultural land used for grazing. It is fairly flat, though there are some rolling hills. In terms of construction, Leipzig says the company benefited from the fact there are already wind farms in the area, including their own Red Hills project. The 2 MW Gamesa G90 turbines selected for the project were a good fit, says ACCIONA. "The turbines for our projects are selected based on the wind profile and our proprietary wind resource intelligence," said project manager Lisa Leipzig. Being in a county that is host to other wind farms, it was a bit more straightforward than being the first wind farm in, she says. "It also helps that ACCIONA has an experienced team that, for example, knows how large the turns need to be on a road to handle the trucks, and the best routes. We had to increase the turning radii at some intersections, but by and large, the routes are well planned, and we have experts that know the best routes to minimize any upgrades or modifications of existing roads. "On site, we strived wherever possible to use the existing road systems that the farmers use for their activities, to minimize site disturbance." Local concrete batch plants were used to provide construction materials. Service Company of Oklahoma. "We have an interconnection agreement for the entire 132 MW of the wind farm. That is crucial to deciding whether a project is viable," says Leipzig. The size of the project gave ACCIONA and Mortenson some economies of scale in terms of construction. "In this case, the 132 MW size fit with the wind resources and made sense from a grid perspective." 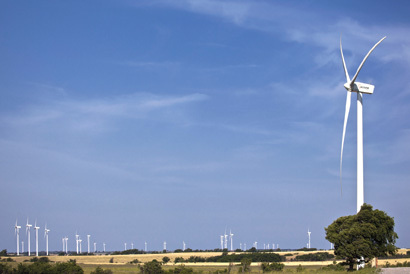 The 2 MW Gamesa G90 turbines selected for the project were also a good fit, says Leipzig. "The turbines for our projects are selected based on the wind profile and our proprietary wind resource intelligence." Mortenson Construction also built the Red Hills wind project for ACCIONA back in 2008. 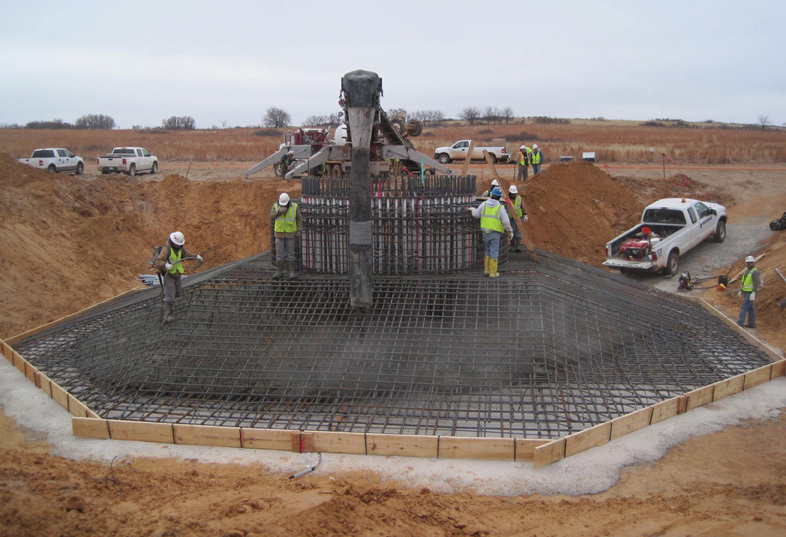 In addition to erecting 66 wind turbines, Mortenson installed underground collection, transmission line, a project substation, and an operations and maintenance facility. Now that the project is complete, ACCIONA has moved into the operations phase with Big Smile. Leipzig noted that the company takes a long-term perspective with its projects. "We're not only a developer of wind projects and a turbine manufacturer. 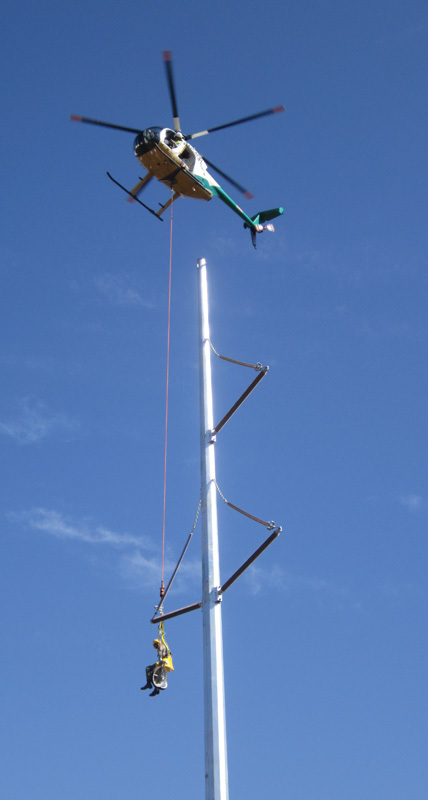 We're also a long-time owner and operator of the wind projects we build. And we strive to be good corporate citizens and good neighbors in the communities where we operate." As an example, ACCIONA will be providing scholarships to students in three local school districts. From development to operations, it all falls under the umbrella of one company, she added. "We're fortunate in that ACCIONA has experienced staff at all levels, from our wind resource expertise to our transmission engineers and our construction and operations folks." This gives the company more control and allows them to keep in-house a lot of work that some development firms have to outsource. With three wind projects operating in Oklahoma right now, and an abundant wind resource, it's very possible that ACCIONA might look at additional projects in the state. At the dedication ceremonies for Big Smile in May, Oklahoma Secretary of Energy Michael Ming noted that the state will have about 3,000 MW of wind power by the end of this year, and renewable energy is a big part of the Oklahoma First Energy plan. He said there is good potential for partnership in using wind and the state's abundant natural gas reserves for power generation. Also at the ceremonies, Bob Koop, the father of Jennifer Koop-Krass, made note of the strong winds that started just as the ceremonies were getting underway, and he wondered, in what looked to be a wistful way, if his daughter might, in some way, be responsible. He felt that she was looking down on the dedication ceremony—with the beautiful weather and the plentiful wind turning the turbines—and smiling.